Receiver suddenly can't get signal from transmitter. Reason 1: Low power battery in transmitter. Solution 1: Use a fresh new battery or plug receiver into a nearer outlet. Reason 2: Plug of receiver is loose. Solution 2: Re-plug your receiver. Reason 3: Reset the receiver by accident so that transmitter is not paired with receiver any more. Solution 3: Repair receiver with transmitter as below. Press and hold the button for changing volume for 3-4 sec. At the same time bring the transmitter closer to the receiver, and hold down its button for a 3-4 sec together. This way transmitter gets re-pair with receiver. Press and hold the button for coding for 3-4 sec. It will bring a lot of convenience to your daily life, use it for front, side, or back doors to gain security and a whole new level of high quality life. TIVDIO IP44 waterproof door chime kit, 32 polyphony sounds to choose, 3 Level Volume; No socket, so you don't have to worry about the receiver blocking the hole under your socket and you can placed anywhere you want. Each receiver can work with up to 4 additional push buttons, and the same to the transmitter. It can be configured with different tones. Placed the received anywhere you want. Install the push button base on the wall with double-sided adhesive tape. 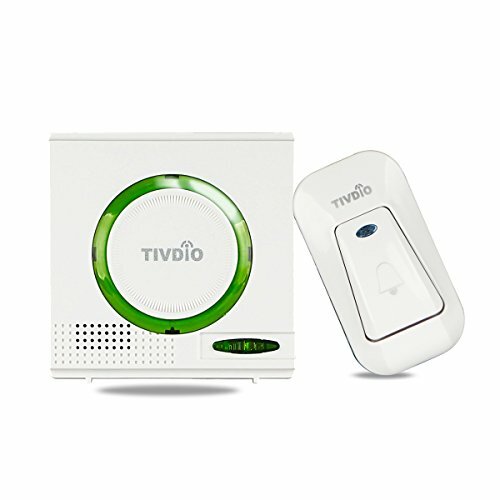 If you have any questions about this product by TIVDIO, contact us by completing and submitting the form below. If you are looking for a specif part number, please include it with your message.